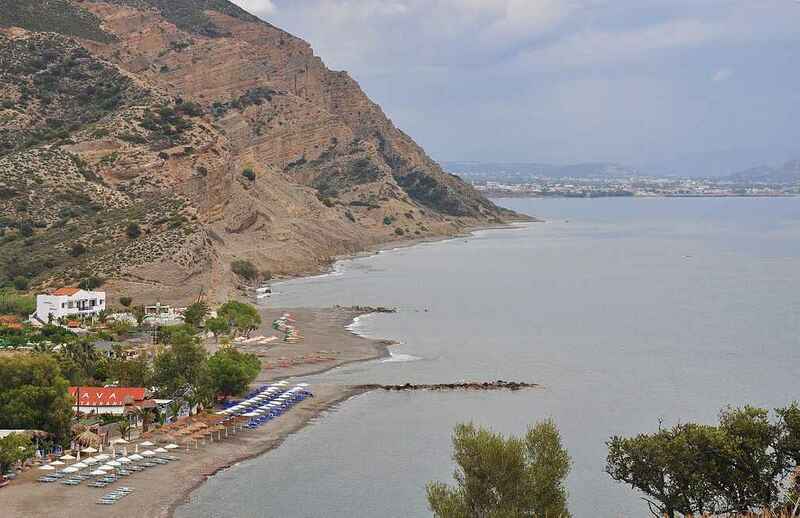 Agia Galini is a beautiful fishing village perched on a cliff in the southern coast of Crete. It is one of the few tourist resorts there. The local beach is just a few minutes walking, and even if tourist development has shifted nudist away, it is still possible to sunbathe in the buff at certain spots. By car, from Agia Galini head north through road 97. One kilometre ahead, cross the bridge and then take the small road on your right that takes you to a camping site and finally to the eastern end of the beach. In this point is where the nudist area starts. If you are staying in Agia Galini, it may be easier to go on foot. There is a pedestrian way all along the shore that takes you to the beach. Pass the main section and its restaurants, cross the bridge over the river, and continue to the end of the beach promenade. This shingle beach is divided in two halves by the river. The western section, close to the town, is usually crowded. There are several excellent restaurants along the beach promenade. The section across the river is quite similar, but usually less people here. In total, it is about 700 m long and 20 m wide. To the East, the beach continues into some little coves at the foot of the cliffs. Here pebbles are bigger and alternate with rocks. Not the most comfortable beach in the area. What is wonderful is the sea, with the calm crystal clear water of the Lybian sea. Many restaurants and beach bars around the beach. They also rent sunbeds in the beach in front of them. The easter you go, the less facilities you find. Neither an "official" nor "usual" nudist beach. According to Captain Barefoot's report, nudism used to be possible in the eastern side of the beach. However, when I was there in 2013 textiles used also this area and I could only find some naked people in the coves at the end, behind a group of rocks. It seems an option for naturists in Agia Galini that don't want to take the car, but there are plenty of much more beautiful beaches in the area available for nudists.